Alternative to traditional fixed braces. Invisalign is a comfortable alternative to traditional fixed braces used to straighten teeth without the metal wires, bands or brackets. They involve of a series of clear, removable aligners changed every two weeks to achieve straighter teeth. They therefore have been an attractive treatment option, especially for adults, who want to avoid the stigma of wearing visible braces. They are also suitable for those who have already had braces and are now experiencing relapse. Invisalign can not only improve the appearance of your teeth by creating a straighter smile, but can also improve the health of your teeth and gums by allowing easier access to remove plaque, which can be challenging with crowded teeth. 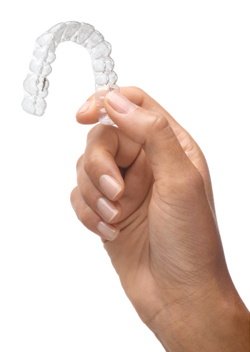 Compared to traditional braces, Invisalign is very comfortable and almost invisible. It is also easier to clean your teeth with Invisalign, as they are removable and don’t have the bands or brackets needed with braces that tend to accumulate plaque and trap food. The first step of Invisalign involves having impressions of the teeth taken. State of the art “Align Technology” is used to scan the impressions and through the ClinCheck® Software, a customised virtual treatment plan is created. The series of movements that the teeth will go through and their expected final position can be seen upfront, before the aligners are made. The Invisalign aligners are worn 22 hours a day, and are only removed during eating and cleaning. Depending on the movements required, tooth-coloured buttons can be placed on certain teeth to assist in these movements. Dr. Trang Truong is our Invisalign dental practitioner and can advise on your suitability for this treatment. If you would like an assessment on your suitability for invisalign, please contact our practice on 3844 8606 or info@familydentalclinicwestend.com.au.